What are you doing Saturday, November 12th around 10am? Maybe you’re going walking with friends or your kids along the beach. If not, doesn’t it sound like a pretty good plan? 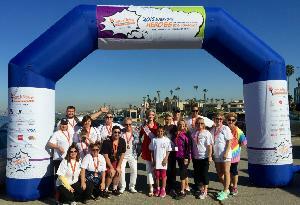 The Torch Relay for Children’s Miracle Network Hospitals is a 5K walk along the Strand on November 12th, starting at Miramar Park in Redondo Beach. By joining our team, we can raise substantially more money for this cause. Donating to Children’s Miracle Network Hospitals while getting a nice morning stroll in, what could be better? Sign up, go to the Redondo Beach page and select “Join a Team.” Type in RE/MAX Estate Properties, hit “Return” and “Join.” It’s that easy! Find our table at 9am during registration on the day of the walk. The registration fee of $20.00 will supply you with a T-shirt, lanyard, and other goodies and also includes lunch. You can also purchase raffle tickets at the event or at the Silent and Online Auctions. Even if you opt out of walking the 5K, there are still plenty of ways you can get involved. Register online with our team and you will get an email link that you can send to anyone who would be eager to support the cause. Clicking the link will allow them to “Sponsor a Participant” and make a team donation. It is also encouraged that you post this link to your social media pages to get some extra buzz. Just spreading the word is incredibly helpful. You can also choose to donate directly. Register online and select “Sponsor a Participant.” Donating to an individual on our team will contribute to our larger team fund. Lastly, if you want to fill out a physical donations form, contact Susan Morrow at (310) 351-9830 or email her at SellingHouses@aol.com. We hope to see you there!